Bolchazy-Carducci: Who Loves Me? : Quis me amat? 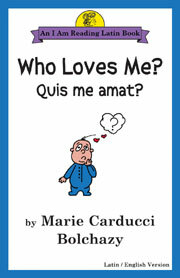 Family love and closeness in Latin, for kids. Aided by original artwork and an English translation, children learn the Latin words for family members: mother, father, sister, brother, grandfather, grandmother, uncle and aunt (father's brother and sister), uncle and aunt (mother's brother and sister), and cousins. The book begins with "This is a picture of me," and the child gets to draw his image or affix a photo. The original artwork is charming and creative. A complete vocabulary, with emphasis on derivatives, and pronunciation guide are provided; a recording of the text is also available.